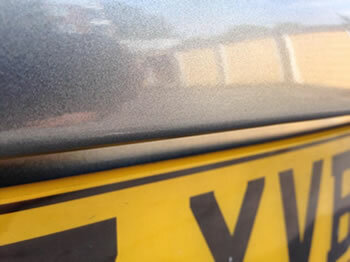 The price and repair time to respray small localised areas depends on the size of the panel. The price to touch-in the majority of the larger stone chips all around the car also varys depending on the severity of the stone chip and distribution of damage. The repair time to touch in the entire vehicle is approximatly 1 hour. The time to spray a localised area with our smart repair techniques would be on average 2 - 3 hours. Car Boy Repairs 4 Less carrys out stone chip repair within selected areas of Hertfordshire, Essex, Cambridgeshire, Bedfordshire and London (to see a full list on areas covered please view below). 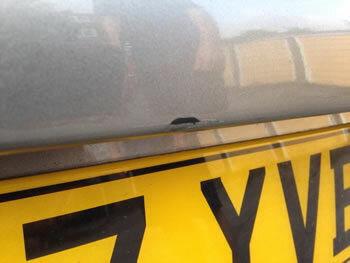 This small stone chip is located on the front bumper of a Fiat 500 in Buntingford Hertfordshire. The customer had the car delivered by a lease company who chip the car in transit. The job took around 1 hours to complete and looks like new. This car had multiple paint chips on the door edges and bonnet. The customer had used the vehicle for a run around and as such got badly knocked in the process. he decided to get rid of the vehicle and used us to touch up the damaged areas. This slight chip is on the rear bumper just above the number plate. Not sure how it was caused but most likely a small knock or very gentle graze of another vehicle would fit the motive. The customer wished us to spray this damage instead of touching it in. It was a lease car so he needed it looking perfect, so we obliged. As you can see apart from the glare of the sun the finished article looks pretty good and would pass any inspection. This customer had just bought his car a few weeks previous and got the chip damage driving on the motorway. Its one of those things you cant avoid unfortunately no matter how you try and protect your vehicle the dreaded chip will always get you some day. This particular one is located on the front wing on a Mercedes in Broxbourne Hertfordshire. A body shop wanted over £300 to fix it, we carried out one of our mobile repairs for just £55, what a difference. This set of chips on the rear passenger door was caused by a council worker on a lawn mower. The blades caught a small stone and threw it at the car that was parked next to the grass verge. The resulting impact chipped out several flecks of paint. The damage was too slight to suggest a panel respray so the customer went with the cheaper option. Once the job was completed the customer was very impressed with the result. This chip on the rear bumper was caused by the impact of a kids bike. The customer wanted to have it touched in and not sprayed, for he was putting the car up for sale and didnt want to spend more than he had to.